Buy 2 Glad Bags and get a $5 virtual visa gift card! 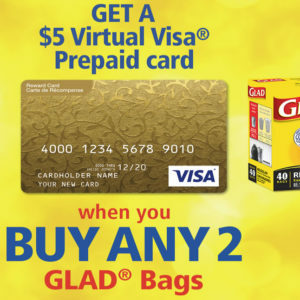 Home » Home & Garden » Buy 2 Glad Bags and get a $5 virtual visa gift card! Get a $5 prepaid virtual visa gift card when you buy any 2 glad bags. Qualifying products must be on the same receipt. You can upload a maximum of two receipts for the duration of the GLAD $5 Virtual Visa Prepaid card promotion. Maximum of one upload per day, per customer.